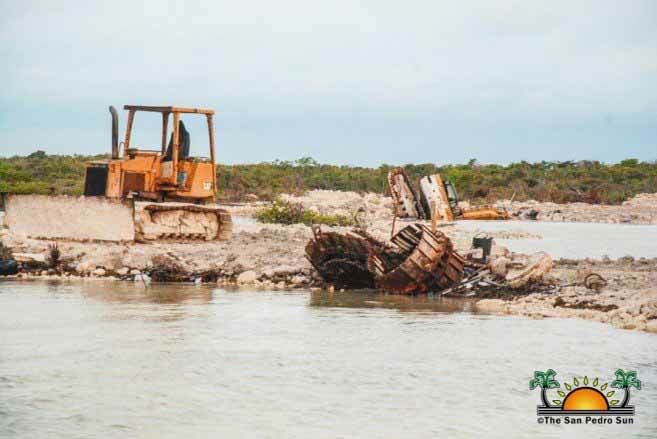 An unauthorized dredging project on the lagoon side of San Pedro Town has received a stop order from the Ministry of Natural Resources and Agriculture via the Mining Unit. Concerned citizens claimed that heavy machinery, including a Caterpillar excavator, had allegedly been used to construct an approximately three-mile channel heading north. The Department of Environment (DOE) confirmed to The San Pedro Sun that the proprietors, believed to be Bob Dhillon and David Mitchell, did not have the required permits for such an activity and the persons carrying out the excavation were verbally ordered to cease operations until an inspection is conducted. A team from DOE is expected to arrive on the island to inspect and verify the nature of the questionable project. Stakeholders are concerned that the method being used to do such a project can bring grave consequences to the sea bed and marine eco-system in the immediate area. One concern stakeholder shared with The Sun that they are not against development, but it needs to be done right and under the approval and supervision of the respective environmental authorities. This is just crazy. How could they even start the work without the permits? "Better to ask forgiveness rather than permission"
Permit are just pieces of paper.....ever seen none drive a car w/o a license? I’ve been here for 4 years and am appalled at all the crap everyone gets away with because they have money and connections to elected authorities who will allow this to go on. Who does David Mitchell think he is, that he can just set up an operation like that? Don’t feel sorry that his machine got stuck in the mud. Maybe he could replace it with the one he left over by Grand Belizean estates, or maybe he’ll move it there to rot with the other one! !